Following in the footsteps of Salt-N-Pepa, Little Richard, Charo and Gladys Knight’s The Pips, Geico has delved into the world of music nostalgia to showcase celebrities who have experienced the heights of popularity but are due for an impactful comeback among a new and younger demographic. The insurance firm this week breaks a multi-media campaign starring Boyz II Men, a group formed in Philadelphia in the late 1980s, who are multi-Grammy winners with 11 albums to their credit. The “It’s What You Do” campaign features the trio of Nathan Morris, Shawn Stockman and Wanya Morris, seen here as conduits of bad news, but with a twist: When they sing dreadful news, it goes down like a spoonful of sugar. 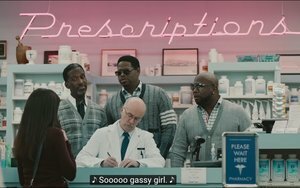 In the lead spot, ”Side Effects,” the Boyz are in a pharmacy, harmonizing as a woman picks up her medication so that the side effects (“dizziness, nausea, sweaty eyelids and, in severe cases, chronic flatulence”) actually make her smile. In other online spots, Boyz II Men takes on bad haircuts, ugly outfits and horrible cooking. “We actually came up with the idea of the spot first: When you’re — fill in the blank — you make anything sound good,” Neel Williams, creative director for The Martin Agency, tells Marketing Daily. “We needed a smooth singer or singing group to make the spot work, and Boyz II Men was our very first choice. The campaign will be expanded when Boyz II Men is scheduled to perform live on Geico’s Facebook Page June 25 (4 pm EST). The Boyz also populate a Geico Web page that links to insurance information. Among the dozen or so 8- to 15-second singing messages are “Birthday” (“My bad, I totally forgot your birthday . . . again”), “Bad Haircut” (“You know your haircut looks like it was done by a blind barnyard animal”) and “Bad Dancing” (“Last night you danced like no one was watching, but, girl, everyone was watching”). BoysZ II Men is currently on The Total Package Tour with New Kids on the Block and Paula Abdul. Barry Janoff is executive editor of NYSportsJournalism.com and a regular contributor to Marketing:Sports.